Four years ago today, a freshman safety sat in the depths of a then No. 15 UCF roster that was playing in the 2014 Fiesta Bowl. His twin brother saw snaps in a game that put UCF on the maps following a 52-42 win over then No. 6 Baylor. Today, redshirt senior linebacker Shaquem Griffin followed in his brother’s footsteps, helping No. 12 UCF (13-0, 8-0 AAC) secure a 34-27 thriller over No. 7 Auburn (10-4, 7-1 SEC) in the 2018 Chick Fil-A Peach Bowl. What was promised to be an offensive showdown between two Goliath offenses, started off as a defensive battle defined by big hits, quick three-and-outs, and a couple costly turnovers. The Peach Bowl defensive MVP was a large part of that, recording 12 total tackles and 1.5 sacks. 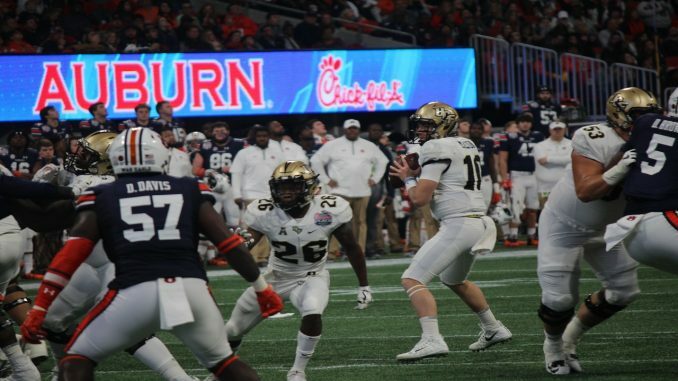 Throughout the game, UCF’s defense managed to force Auburn redshirt sophomore quarterback Jarrett Stidham to the ground six times, while intercepting him twice. The most important interception though, came from redshirt senior linebacker Chequan Burkett, who picked off Stidham and returned the ball 45 yards for a pick-six. The defensive touchdown broke up an Auburn offensive drive and increased UCF’s lead to 14 with under six minutes left of the game. “Chequan Burkett getting a pick-six, didn’t know if we were going to have him this year, and he pulled that off,” sophomore quarterback McKenzie Milton said. Stidham managed to complete 28 of his 43 pass attempts, throwing for 331 yards and one touchdown. But while a UCF defense that that fans have been yearning for, gave one of the nation’s best offenses trouble on the field, the nation’s highest scoring offense in the country failed to find the endzone until nine minutes remained in the first half. Milton struggled early on, looking like his former 2016, mistake-prone self. Milton only completed two of his first 10 passing attempts, but ended the day as the Peach Bowl’s offensive MVP, completing 16 of 35 pass attempts. He threw for a total of 242 yards and two touchdowns, while taking only one sack. But mistakes kept fans, players and coaches on their feet as Milton fumbled a snap, threw balls into double coverage with no logical target in sight, and was nearly intercepted a couple of times. “Yeah, you know, we kind of came out sleepwalking, throwing the ball in the air. I don’t know if it was the big lights or the big Jumbotron,” Milton said. However, the dual-threat quarterback impressed 71,109 Peach Bowl attendees and millions of home viewers not only with his arm, but rather his ability to run the ball and escape from pressured situations inside the pocket. Milton led the Knights in rushing with 116 yards on 13 rushes, finding the endzone once. His longest run came on a 23-yard sprint. Milton found first down son seven different occasions using his legs against an SEC team that is known to stop the run. Auburn managed to score on a seven yard run with 4:12 left of the game to make it a one-score game and get the ball back with 2:18 left of the game after UCF missed a 38 yard field goal. But a clock running down and lack of timeouts caused Auburn to throw an interception with less than 30 seconds left of the game just outside of the UCF redzone. Freshman safety Antwan Collier made the game-ending interception, but was only playing because junior Kyle Gibson was previously ejected on a targeting call. The Knights finished the season as the only undefeated FBS team in the country, tallying 13 wins, an AAC East title, an AAC championship, and topped it all with a Peach Bowl victory. They’ll look to find their final rankings in the AP-Top 25 poll when the rankings are released following in the weeks after the CFB Playoffs are concluded.